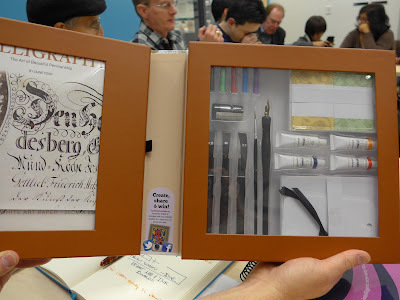 Vancouver Pen Club: Last meeting of 2017! Many thanks to the fifteen VPC members (including newcomer Jim M) who came out to the Terry Salman branch of the Vancouver Public Library on a rainy night for our November 16th meeting! 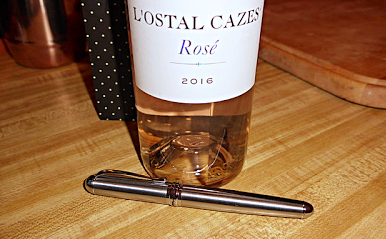 The evening's primary theme/topic was "What pen-related gifts did you get for Christmas/the holiday season in the past, and what pen stuff would you like to get this year...and why? " (many thanks to Mido for the theme idea!) and our secondary theme/topic was -as usual- Newest Acquisitions. Mido's green Pelikan M200, a gift from his family. 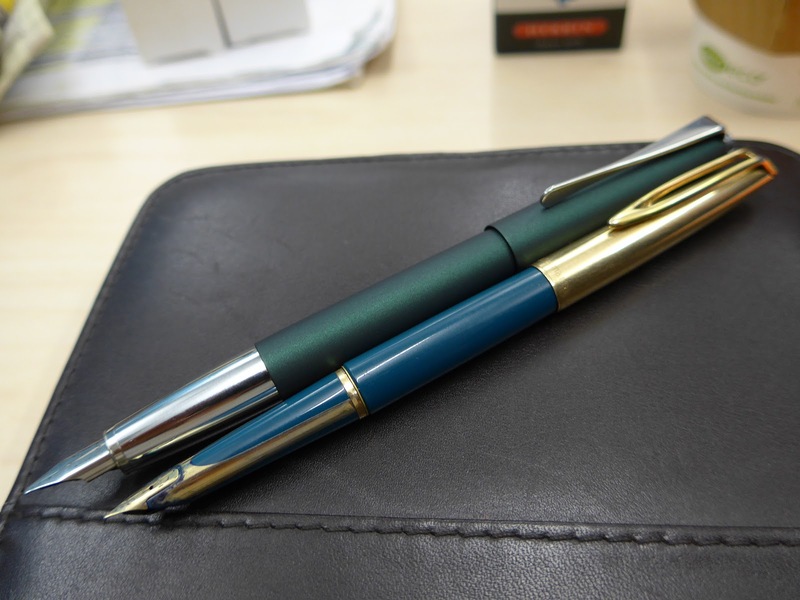 Mido is hoping to add a Pelikan M800 or M1000 to his collection, in the form of a Christmas gift. Great choices, Mido! Two more new pens of Stuart's---a modern fountain pen (Lamy 'Studio' in the Special Edition "Racing Green" colour) and a vintage one (teal Waterman C/F). 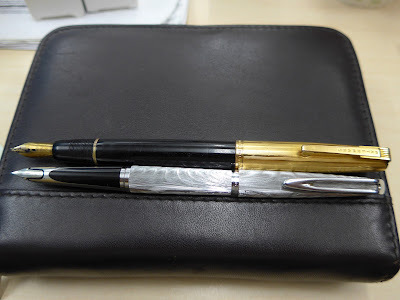 I'm sorry that I didn't snap a photo of the two pens Stuart received as Christmas gifts---two handsome Sheaffer 'Legacy' fountain pens (I'll try to photograph them at January's meeting). 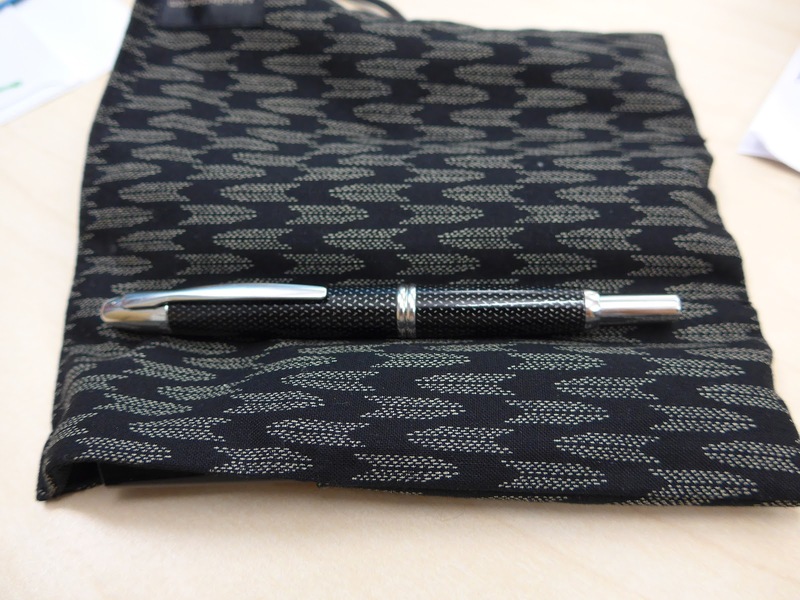 Being a vintage pen fan, the #1 pen on Stuart's wish list is an original Parker 'Duofold'. 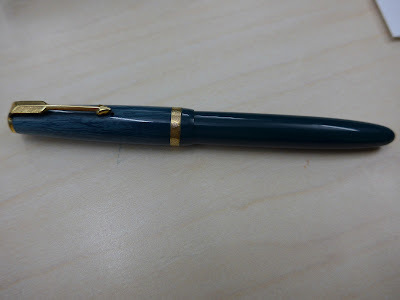 Jerred always has some very interesting new pen-related acquisitions to show us. This time he brought (bottom to top) a jet-black M&G fountain pen (a very Lamy cp1-like pen), a Spalding fountain pen in black maple, a PaperMate 'Monogram' fountain pen, and a pen-of-unknown-model from Aliexpress in a bright blue colour (I photographed its light-blue counterpart at last month's meeting). 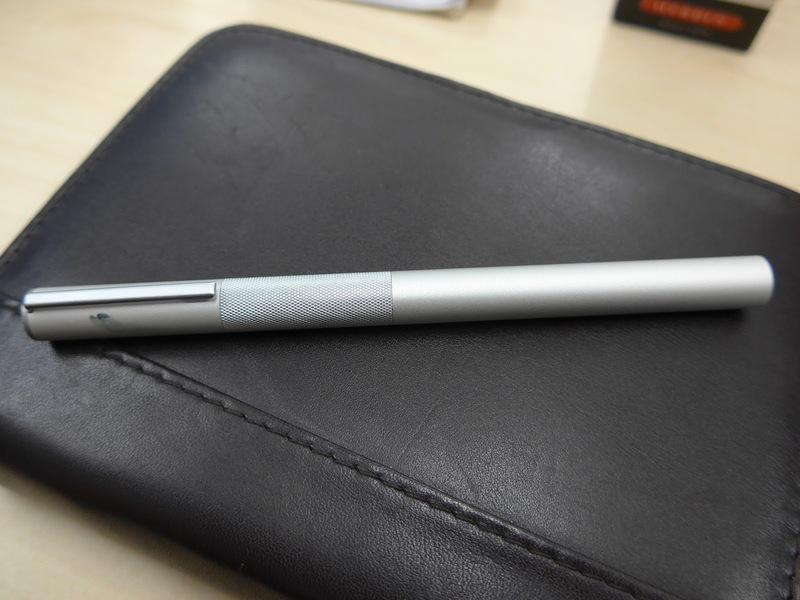 Jerred's dream fountain pen? 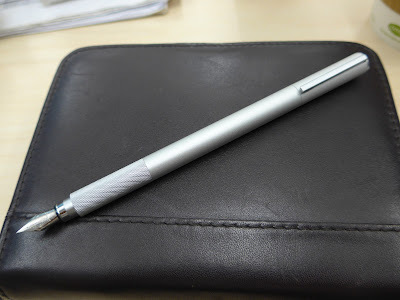 A cool Muji 'Aluminum Round' fountain pen recently purchased by Tsung-Yen at the Muji store at Metrotown mall in Burnaby. His wish for a Christmas/holiday pen-related gift is the ever-popular Pilot 'Vanishing Point' fountain pen. 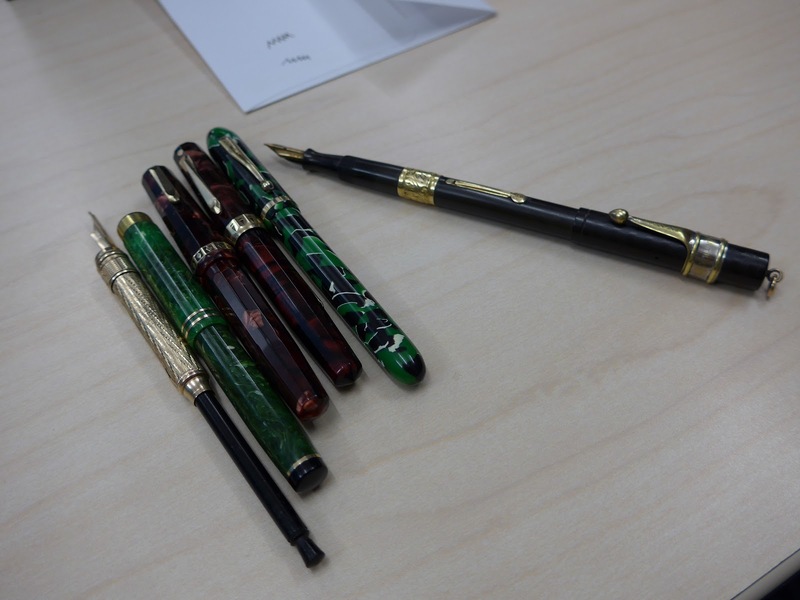 Longtime VPC member Christopher showed us his latest vintage pen finds, including: (L-R) an Aikin Lambert retractable dip-pen made of rolled gold & ebony (ca. 1860), three Wahl-Eversharps (including two lovely Dorics), an E.Faber in a colourful green & black marbled design, and his best find - a black Waterman '52' with wide gold band & mercantile clip. A photo showing (in the foreground) the adjustable nib on one of Christopher's Wahl-Eversharp Dorics. Christopher's Christmas gift wish was granted a few years ago when his wife Chris bought him the Montblanc '149' he really wanted. 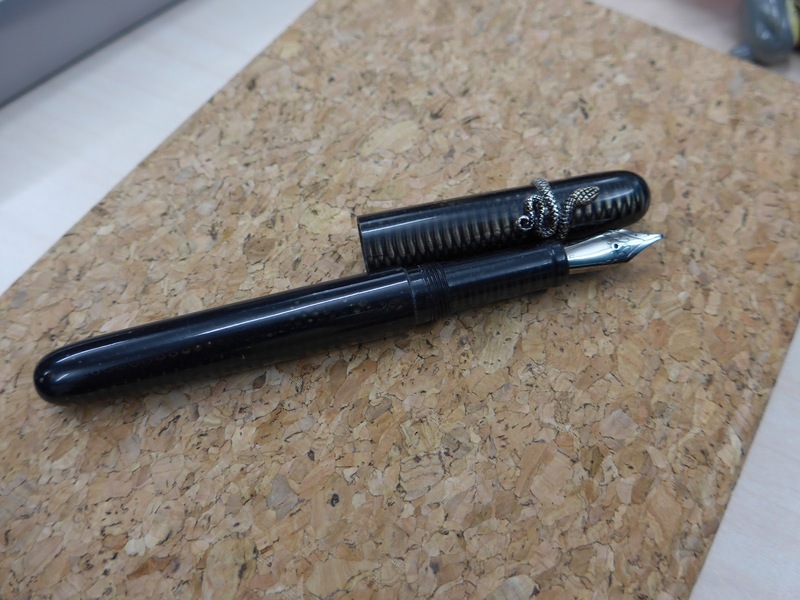 I asked Christopher which pen was currently at the top of his wish list, and he immediately said an over-sized Parker Vacumatic (ca. 1932-1933) in red stripes, with double striped jewels, a matching section and perfect clarify. Wonderful choice! One of Ricardo's newest fountain pens is the Martemodena 'Federico' in the red marbled "Hell's Bells" pattern at the top of the above photo. It came with a second barrel in orange (not pictured) and is a chunky, but light fountain pen. 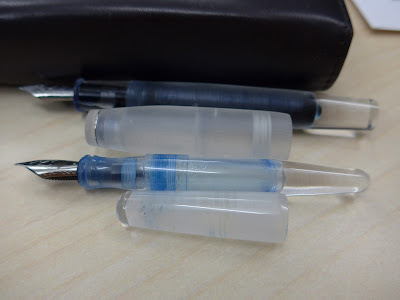 The other two pens are his blue Pelikan M805 in Vibrant Blue and a clear TWSBI 580. 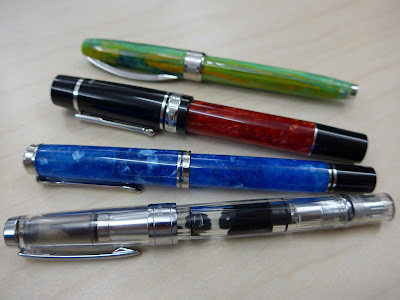 All great pens! 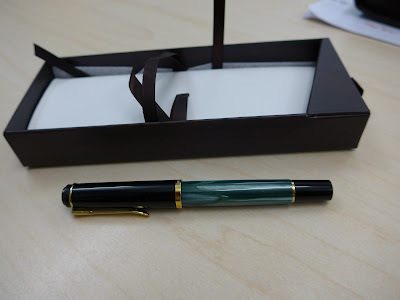 The beautiful swirly-green fountain pen at the top is another recent acquisition---a Visconti 'Van Gogh'in the "Irises" pattern (the colours were inspired by Vincent Van Gogh's famous paintings of the flower). 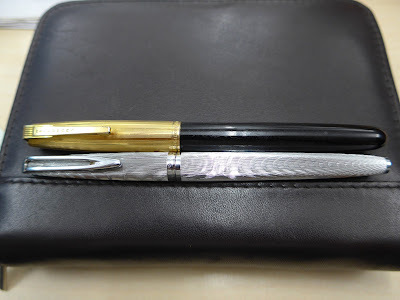 He's only received fountain pens for his birthday and work, but Ricardo's Christmas wish-list pen is another Visconti - their popular 'Homo Sapiens' model. Rohit brought in two pen-related Christmas/holiday gifts for the meeting's topic --- a gold Lamy 'LX' (not pictured) and this handbook on cursive writing---but he prefers to buy his own pens, given that he knows exactly what he wants, and where to find it! 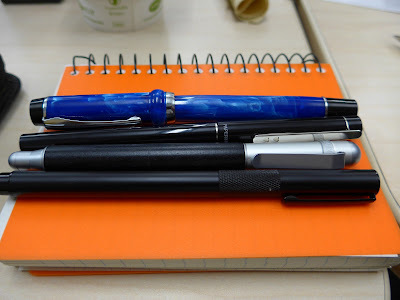 The amazing fountain pens in the photo are (L-R) Rohit's two Visconti 'Homo Sapiens' pens, an Aurora '88 Minerali' Azurite Blue Demonstrator (a limited edition---only 388 pieces were made), a glossy black Montblanc 'Heritage 1914', and a Lamy '2000' Stainless Steel. All iconic modern fountain pens! Martin swung by our meeting to ask about a pen he got many years ago as a gift---this handsome Parker Duofold with a large 14K gold '50' nib. 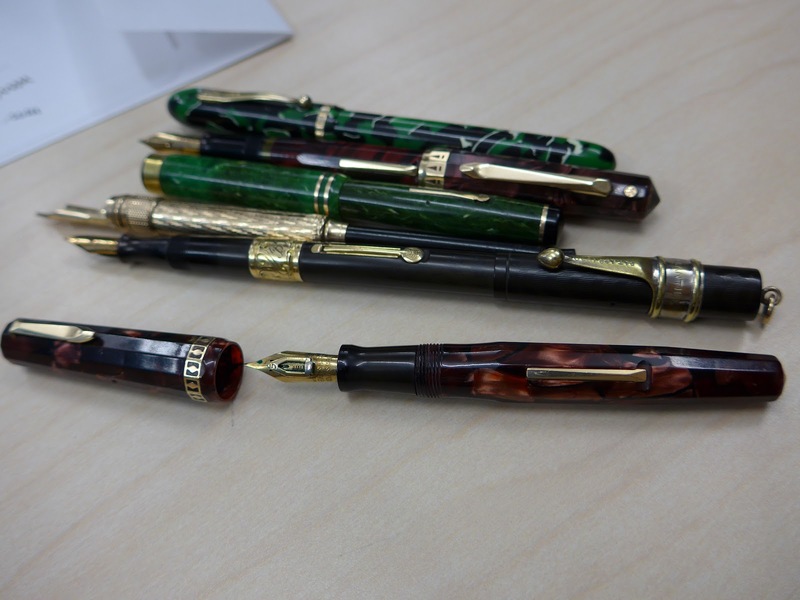 These pens are known as "English Duofolds", to distinguish them from their American counterparts, and often come with very nice gold nibs. 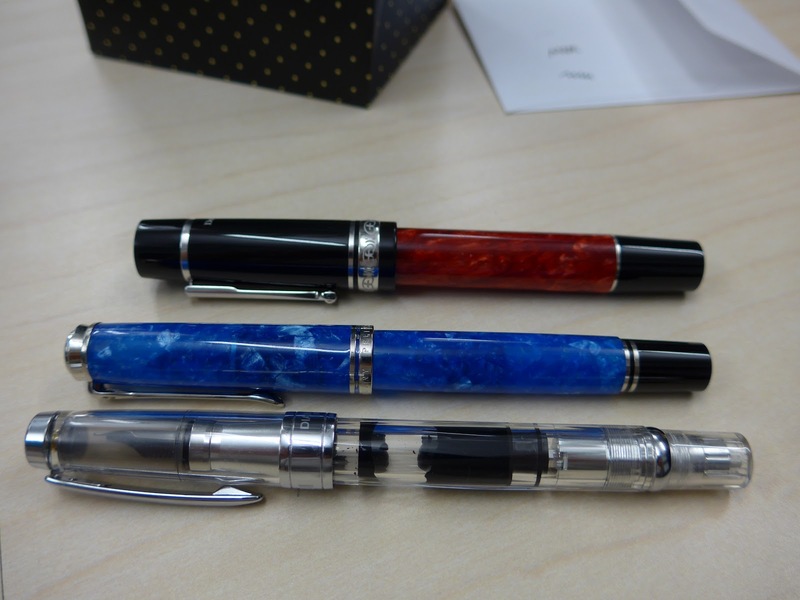 Barry's newest writing instruments (top to bottom)---a black Lamy '2000' fountain pen, a Conway Stewart mechanical pencil, a red marbled vintage Waterman fountain pen & pencil set of the Waterman "2 Lady size" model, and a grey marbled Parker 'Parkette' (ca. 1938). 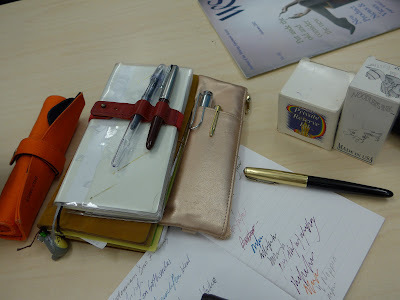 He acquired all of these items, except the Lamy, at a local antique store on the day of the meeting (well done, Barry)! Barry's current pen wish list includes an Aurora Optima in Aurolide Blue, a vintage classic---the Waterman 'Patrician'---and a modern classic---the Montblanc '149'. 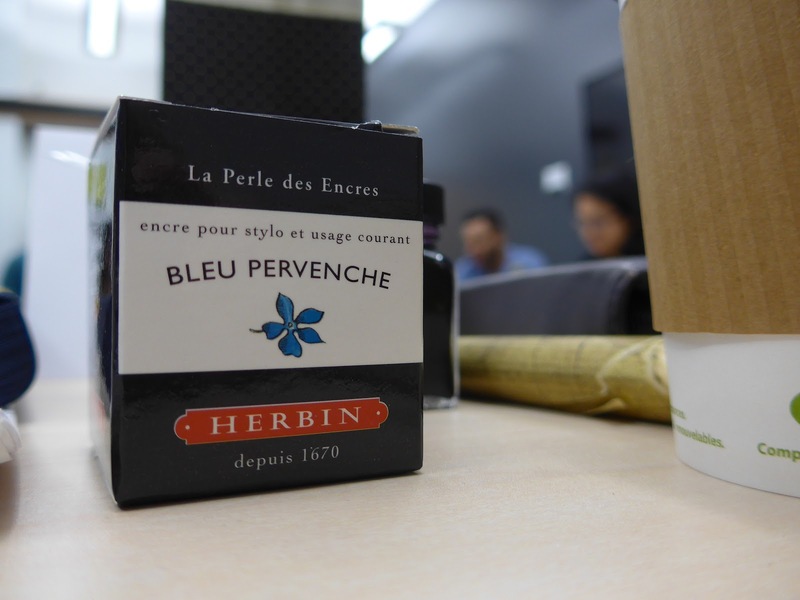 A shot of one of my newest acquisitions--a bottle of J Herbin's "Bleu Pervenche" (blue periwinkle) ink, purchased (along with some beautiful Monteverde "Rose Noir" ink & a white Lamy 'Safari') at Charal's the night before our meeting. Charals is a wonderful pen store in downtown Vancouver (near BC Place) that has an amazing array of fountain pen ink, fine paper, writing instruments at every price point, and other gift items. 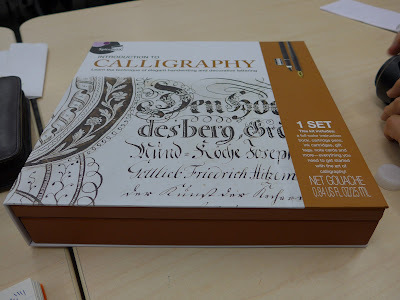 Our newest member, Jim M, holding up one of Bruce's Christmas gifts from 2016----a large calligraphy set in a very nice box! Bruce's Grail Pen is a maki-e fountain pen. Bruce's wonderful Christmas self-gifts (L-R): a gorgeous Visconti 'Metropolitan' (one of a very limited # made---Bruce's is 03/22), a Montblanc 149 from the mid-1960s, and a Pilot 845 with juicy BB (double-broad) nib. That's one of Jim's newest purchases---a beautiful Edison 'Pearlette' in the "Sonoran Sky" colour, made by Brian Gray of the Edison Pen Company , a highly-regarded American maker of handmade writing instruments. The black pen above is a Pilot 'Vanishing Point' in black carbonesque, a self-gift that Jim bought for himself. The VP (as it's known) is a modern classic, a fountain pen with a retractable nib that operates using a clicking mechanism, much like a ballpoint. On his Christmas wish list is another Pilot---a vintage Pilot 'MYU' with black stripes. My (Maja's) Christmas haul from the last few years! 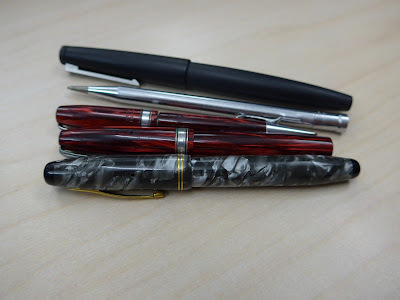 From L-R: Sheaffer '300' ballpoint, Noodler's 'Ahab' in the "December 25" pattern, red Pelikan M205, ThINK fountain pen in the "Giraffe" pattern, black Sheaffer 'NoNonsense' and an ivory Delta 'Journal'. The Sheaffer ballpoint was a self-gift, the 'NoNonsense" was a Christmas gift from my cousins in northern California, the Delta was purchased with money from my in-laws and the others were given to me by my parents (after I "steered" them towards those particular pens ;). 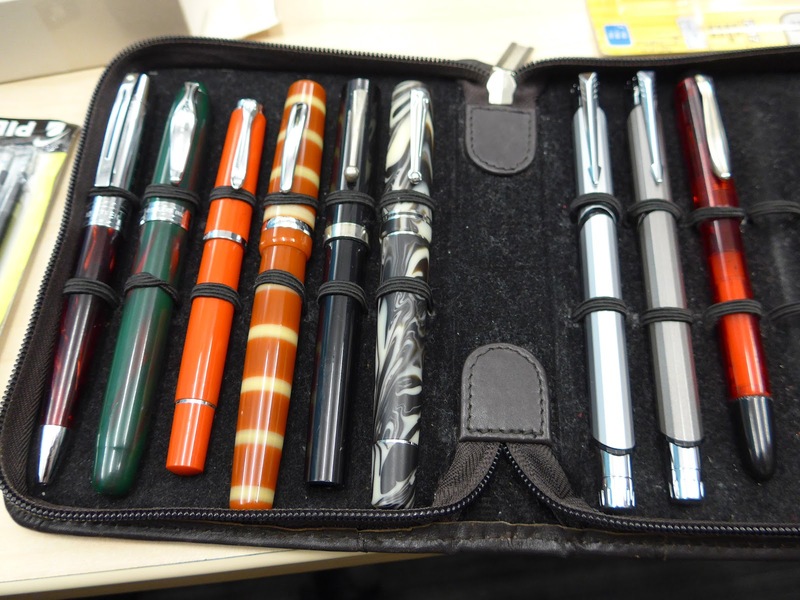 The pens on the right-side of the pen case were all given to me for Christmas by my very generous friend Glenn, who lives in Australia. From L-R: two Parker 'Facet' fountain pens and a FPR (Fountain Pen Revolution) 'Dilli' model with flexy nib. I brought a few more pens that Glenn sent me (a beautiful Sheaffer Slim 'Targa', a Waterman 'Kultur', and a FPR 'Triveni') but they're not pictured. 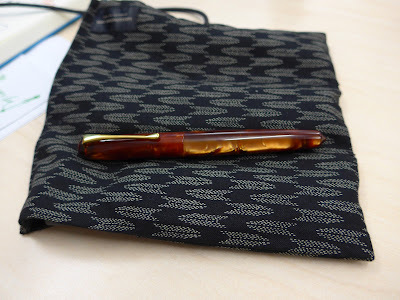 At the top of my Christmas wish list is a Pilot 823 amber demonstrator fountain pen. That's Mindy's amazing celluloid snake pen, created by Fisher of Pens, a maker of handmade pens located in South Carolina. 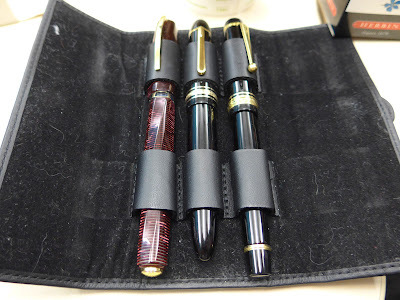 Mindy's only pen-related Christmas gifts were some Sheaffer NoNonsense fountain pens from her brother, but her dream pen is a Nakaya fountain pen with a snake "rolling pen stopper"! 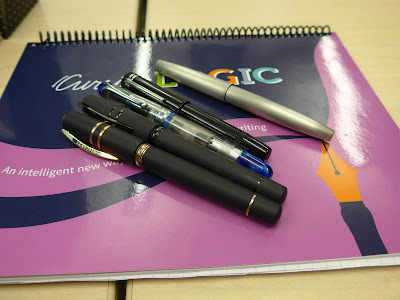 Alejandra's pens (including a clear Pilot 'Penmanship' she just bought from Mindy at the meeting :) and some inks she brought in for our voluntary pen & ink trade. Alejandra is hoping that Santa leaves a vintage fountain pen with an adjustable nib under the tree. 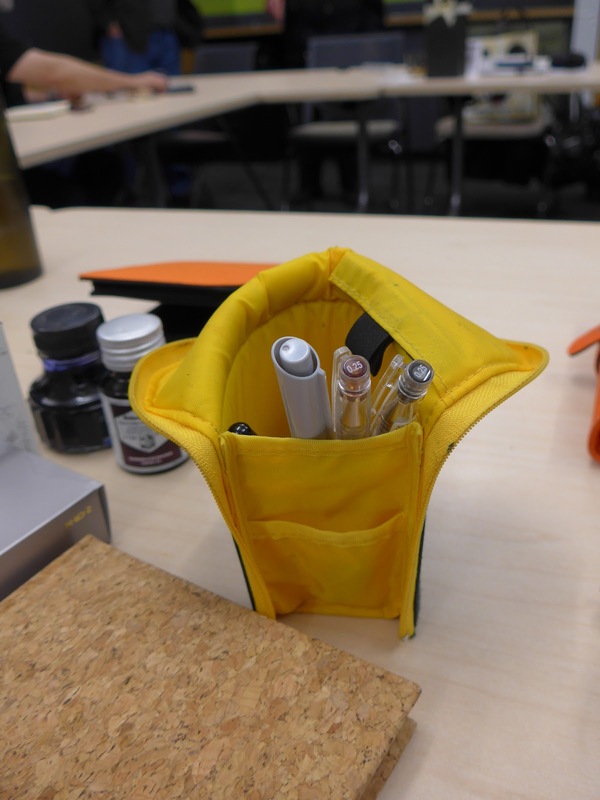 Mindy's Neo Critz pen case, which transforms into a pen stand! The pen case is made by Kokuyo and is sold by JetPens.com (among others). In their writeup on the company, JetPens writes Kokuyo Co., Ltd., was founded in 1905 to manufacture book covers for account books. Back then people perceived Kokuyo as a "trash business" as few cared about book covers. 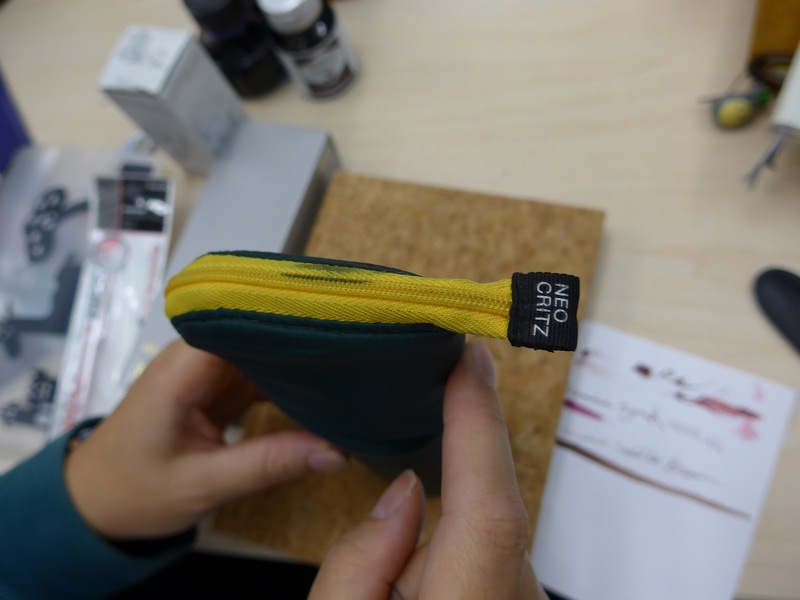 However, Kokuyo's founder Zentaro Kuroda made tremendous efforts to change this perception and motivated his employees to make products needed by society. 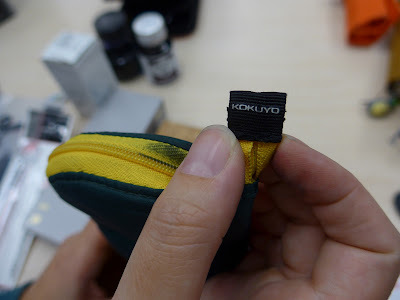 Today, the company has become a conglomerate called the "Kokuyo Group" that produces almost every type of office product imaginable. Thank you so much, everyone, for your thoughtful presents...and also for your contributions to our meetings. This club wouldn't be the same without your enthusiasm and participation! ~~~~~~~~~~~~~~~~~~~~~~~~~~~~~~~~~~~~~~~~~~~~~~~~~~~~~~~~~~~~~~~~~~~~~~Our next meeting won't be until January 2018 (it will almost certainly be held on Thursday January 18) as we don't have December meetings, so please check our website for more info/updates. Alternately, you can sign up for email alerts about new posts by entering your email address in the "FOLLOW BY EMAIL" field on the far left-hand side of each webpage on this blog. Thanks again to my fellow VPCers for a great 2017!